this beautiful hunger: Dinghies Rule. Well I'm sizzled and sozzled by all this heat and sun, my skin is salty and red and my feet are sore and pummelled from all the walking upon sharp, pebbled beaches I have been doing today. But it's all been worth it for I have bought a dinghy! Well, more correctly, Jo and I are now the proud owners of 'Rapid 4000' (soon to be replaced by a fairer name when we think of one), a blue, white and yellow vision of loveliness and rubber. In my last post I talked about certain strange desires that come upon me from time to time. Well, I reckon that dinghies are the new 'answer to everything', and my desire for one today grew to such epic proportions that I could think of nothing else except the vision of Jo and I bobbing up and down like queens in our dinghy palace, gin and tonics in hand, a troop of lithe young men in fetching shorts trailing behind us attached to rubber rings. Jo and I braved the crowded stretch of beach between home and the Palace Pier at least three times seeking out the lowest price, (with preferable free pumping upon purchase), and so we were elated when we finally hunted out one that was the best price by far, and they even threw in a pair of oars for free. The only problem was getting it (fully inflated) all the way home again after our first outing in the sea. I had initially suggested that I row it all the way from Churchill Square, then around the West Pier, meeting Jo with the bags on the other side. But after it became clear that the only moves I seemed capable of were rotating us 360 degrees repeatedly until Jo had to take over, we decided that carrying it home would be safer. Since Jo's wrists were playing up, I had the joyful task of carrying all 8 feet by 4 feet of dinghy on my head, through the heaving hordes of holidaymakers making their way up the sea front. We finally made it to Hove and rewarded ourselves with delicious pizza and chips in Maroccos, before pushing the dinghy out again, by now, into the darkening sea of sunset. I was getting the hang of the oars finally, and we effortlessly sped out into the milky blue water as the shadows of the shoreline faded into the distance, and fireworks exploded silently over the Palace Pier. Brighton looks very different from this far out to sea, we were starting to slide out into silence, where there were only gulls, tinkling fish, and a yellow buoy in the distance. This is where I want to spend my days and nights in this town of mine, this side of the sea front. This is where the inspiration is, where poetry bobs up and down with the plastic under our hands. This is my kind of home. Jo put her head back and looked up at the electric blue sky. Stars were beginning to peep out from behind the clouds. The night was perfect. After a gentle arrival back into shore, and a bumpy landing on the beach, we wobbled our way back to my flat, dinghy in tow, our legs exhausted from too much swimming, our arms weary from so much rowing, our skin smarting from the salt and the sun. But I, ever the impractical and slightly over sentimental one, decided that I couldn't bear to deflate our lovely new blue girl, and that she would have to be dragged, fully inflated, up to my top floor flat, where she could reside happy and fat in my exceedingly tiny hallway. So drag her I did, up three flights of narrow stairs, around squeaky corners and finally into my nine-foot hallway did we push in all eight-foot of her blue magnificence. Sitting here now I think, well, if I'm not to have a boyfriend at the moment, then I shall have a dog instead. 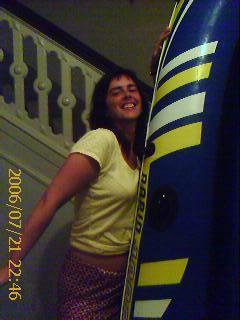 But if I'm not to have a dog at the moment (I've got to think a way around the landlord), well, a dinghy it has to be. She's a lot less complicated than a man, and though she does take up more room, you can deflate her and fit her nicely in a little plastic carry all, and pump her up again when you need her. She doesn't poo and she doesn't break your heart, you don't have to take her for walks and she won't tell you how she just 'needs some space' at the moment. So there you have it, all existential problems undone. I now know how my days and nights this summer will be spent. Dinghys rule. Oh my. I am so purchasing a sister vessel and joining you out there, just as soon as I'm allowed out the house, that is. This might seem like a strange request, but I have a Rapid 4000 for which I have lost the cap. I did not buy the dinghy myself and do not have the box. Any chance you know the product code or some similar information so that I can buy a replacement?